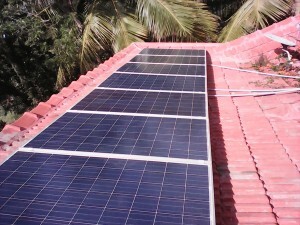 We offer turnkey installation and commissioning of solar plants in Southern India. We have installed 300KW of rooftop and ground mounted solar plants in over 20 different sites in the States of Tamil Nadu, Andhra Pradesh, Kerala, and Rajasthan. We have a dealer network that covers all districts of Tamil Nadu through whom we can provide local installation and support for your solar projects. The pictures below showcase few of our installations. Please call us for your solar plant installation requirements.